Casino games, rules, and gameplay. Roulette, Black Jack, Stud Poker, Dice (craps) Texas Hold’em Poker, Wheel of Fortune. All our gaming equipment is authentic & is maintained to a very high standard. Please remember you and your guests do not have to be an expert at any of the games. Allow the croupiers to guide you and your guests through each game, to ensure you get the most fun out of any casino game played. 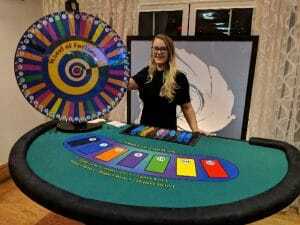 Roulette is the most famous & glamorous of casino games and no fun casino night would be complete without a Roulette table. Place a bet on a single number, odds 35 to 1, split two numbers, odds 17 to 1 or play the even chance bets, black, red, even, odd, etc. 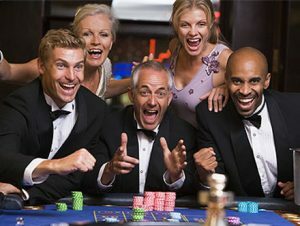 Change your ‘Fun’ money at the Roulette table and your croupier will give you colour chips, everyone will usually have different coloured chips, this helps you quickly identify whether you are one of the winners. When the ball drops into the winning number it will be marked with a “dolly” the croupier will then pay the winning bets. This fun casino game can accommodate 10-25 players at any one time. Remember, not everyone plays at the same time. 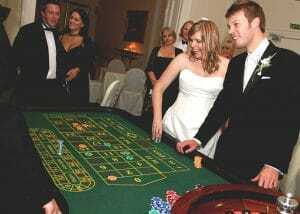 Read more about Roulette table hire / how to play Roulette. Wheel of Fortune is an extremely easy game to play. With the spin of a wheel, you could leave the table with thousands of £’s, just a shame you cannot use it after your night of excitement! The Wheel has 7 different types of fruit that you can bet on. Place your chips on the fruit you think is lucky for you. You or the croupier will ‘Spin’ the wheel to determine the winners & losers. The “Wheel of Fortune” is that easy, everybody wants to play!! Object Earn the maximum payout by placing wagers correctly. Of course, the odds and payouts differ for each betting option, so choose wisely. And always remember, that no matter how you bet, the odds are designed to favor the house. In every hand of Texas, each player will put money in the pot. then the dealer will deal each player two cards, these are known as the “Hole” cards, dealt face down each player can view their own cards. Hold’em can be played with as little as two players (going “heads up”), up to a max of eleven players. Texas Hold ‘Em is Seven Card Stud where each player gets two down cards; “Hole” cards with the remaining five up cards; “Community” cards being placed in the center of the table which all players use to complete their hand. Like most variants of poker, the objective of Texas Hold ’em is to win the pot—the sum of the money bet by oneself and other players. The pot is won either at the showdown by forming the best poker hand out of up to 7 cards available, or by betting to cause other players to fold and abandon their claim to the pot. Read more about Poker table hire / how to play Texas Hold’em. Blackjack is a variation of Pontoon and by far one of the most popular games, an ideal game for novices & the more experienced player. This is certainly another one of those must-have games, at any fun casino night! The dealer will deal two cards face up to each player & one face up to herself. Each player will then be asked in turn if they would like any more cards. 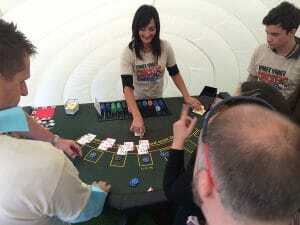 Once all players have been asked, the dealer will then deal herself cards. Are you a winner or Loser!! Blackjack can accommodate 9-27 players, great fun for novices, pro’s and players of all ages. 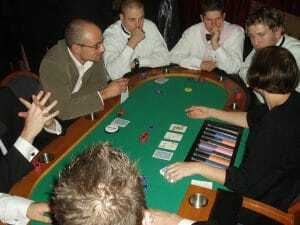 Read more about Blackjack table hire / how to play Blackjack. Play As the dealer turns the cage end over end, the players place wagers on specific outcomes of the dice. When all bets are placed, the dealer stops the cage allowing all three dice to rest on the bottom. The outcome of their position determines the payouts. If you already have some knowledge or know what you’re doing, you should go straight to the Craps table.cheering. 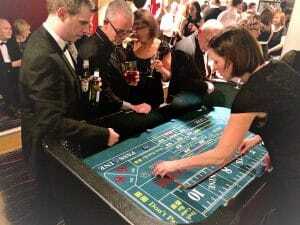 Craps is played with two dice, players bet on the outcome of the numbers thrown. The player throwing the dice is known as the shooter. Other players may place their casino chips on the table’s layout and win or lose according to the numbers thrown by the shooter. If you’re new to the game, don’t worry, the dealer is there to ensure you & your guests have fun at any game you play! Casino Stud Poker is one of the easiest & friendliest of poker games, in which the players are trying to get a higher hand than the dealer’s hand – they are not competing against each other. Casino Stud is played at a table similar to blackjack. The attraction of the game is the high pay-off if you catch a good hand which qualifies. The dealer requires Ace, King or a higher ranking hand to qualify, if not she will pay all the ante bets, not bad! Each player decides or bluffs whether to continue playing if so you need to double your original bet & place it in the raise box. This is when the excitement begins, is the dealer playing or not! 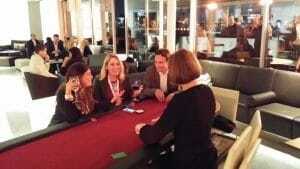 Read more about Poker table hire / how to play Stud Poker.